This kit Fits the 1970-1975 Duster A-Bodies, We have another kit for the Dart/Valiant - the wheelbase is different and requires a different frame connectors!! Purchasing these chassis stiffening components as a kit will save substantially over purchasing these individually. Where does the Chassis Stiffening Kit mount? The kit mounts to the unibody of your Mopar and adds strength and stiffening to the entire unibody structure. This the most complete kit and adds the most strength available, short of adding a full roll cage to your car. 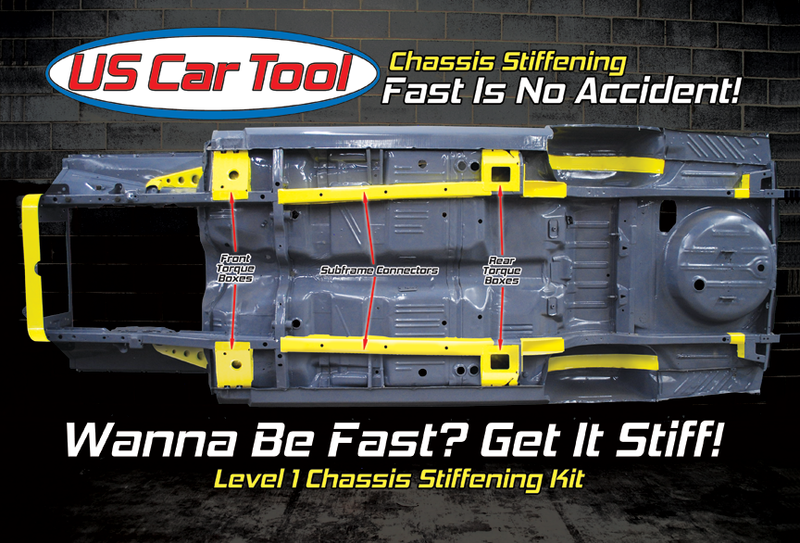 Does my car need a Chassis Stiffening Kit? The factory engineers added stiffening to some ares of the A-Bodies, so they recognized the benefits of the bracing 40+ years ago. We've just got the benefit of seeing how these react to the added chassis stiffening. Any car will benefit from the additional chassis (unibody) stiffening, especially if you are increasing the horsepower or just want you car to feel more "solid" going down the road. Frame Connectors add strength to the middle portion of the unibody, our design maximizes the strength of these via cantilever beam engineering to increase the Section Modulus of Elasticity. This is twice as strong at half the thickness!! Torque Boxes distribute the brute forces placed on the Unibody at active suspension mounting locations; think front leaf spring hangers pushing the car forward on a 600hp launch! When you remove the flex from your chassis (Unibody) you allow the suspension to work as it is designed. Now you can adjust spring rate, roll resistance (sway bars) and shocks and actually see and feel the difference! Are these duplicates of the OEM factory Braces? No, we build a version we refer to as our Hot Rod Brace Upgrade. Some of the stiffening components fit in the factory location, such as the torque boxes and inner fender braces, other components just add strength to known weak spots on the unibody. Yes, installing a Chassis Stiffening Kit requires them to be welded into position. Will you install the components onto my car? Yes, our installation center installs all the parts we manufacture for a set low price. Im not sure exactly what I need for my MOPAR suspension upgrade, can you suggest an upgrade to my car? Yes, we have installed chassis stiffening components on 100's of MOPAR's and have been in business saving old MOPAR's for over 10 years. Contact us at (919) 855-8200 with any additional questions - we like to help!! Copyright USCT Motorsports. All Rights Reserved. eCommerce Software by 3dcart.